The pleasure of driving increases in the moment you have an Opel Corsa, provided with an automatic box and the best audio system comparing with another car of its type. You can rent this car with a sporty design for only 22€/day and with all the facilities included: all the taxes are paid, you got RCA and full CASCO and a full of fuel that you can use to drive hundred of kilometers. The engine develops between 85 and 95 CP and uses only 5.5 l/100km. More than this, it has a really big trunk, which has almost 200 l and which offers an additional comfort. The rental car has servo direction, electric windows, air conditioning, radio cd with mp3 player, centralized closing. This car is available only in the 4+1 version with 5 doors and a hatchback body, through the Bucharest and Otopeni rent a car service. 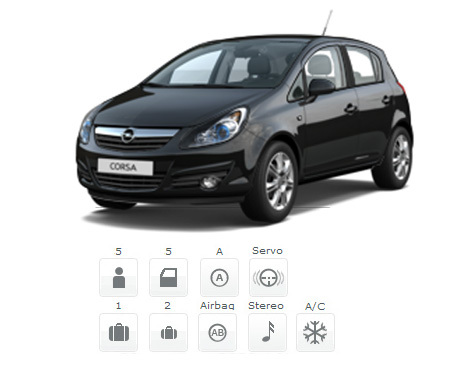 Opel Corsa, provided by the car rental service of FocusRent, is a dutch car that is really appreciated by our clients. First of all, this small car with a low consumption allows you to drive the crowded streets of Bucharest, outside the city or even across the borders without being afraid of the quality of the experience. Even if it is an economical class car, its size allows you to take with you any suitcase for your holiday or your business travels. Come and test this sporty car that you can have through FocusRent’s rent a car service. Our customer care personnel will give you any information about our car rental system and they will help you to fill the online form. Call us to (+4)0735-05-7777.